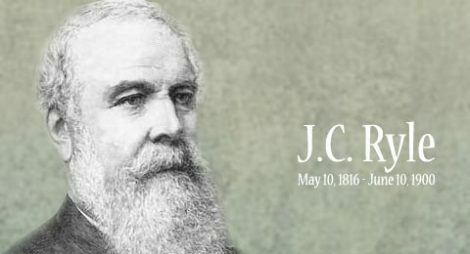 Even though J.C. Ryle was raised in a nominal Christian home, he once believed that Christianity must be one of the most disagreeable occupations on earth—or in heaven. But one day he happed into a church where, hearing Scripture read out loud, he was transformed. One verse, and the emphasis made in between each clause, gripped him. “By grace are ye saved . . . through faith . . . and that not of yourselves . . . it is the gift of God.” Reflecting on his conversion, Ryle said, “Nothing to this day appeared to me so clear and distinct as my own sinfulness, Christ’s preciousness, the value of the Bible, the absolute necessity of coming out of the world, the need of being born again, and the enormous folly of the whole doctrine of baptismal regeneration.” And he never looked back. Ryle grew up in a wealthy home, wanting for nothing, heir to the family fortune, in pursuit of a banking career, walking in his father’s footsteps. In 1841, however, his father’s investments collapsed and instantly his whole future changed. “We got up one summer’s morning with all the world before us as usual, and went to bed that night completely and entirely ruined.” He described that experience as “the blackest chapter of my life.” By fall of that year he applied himself to Christian service. 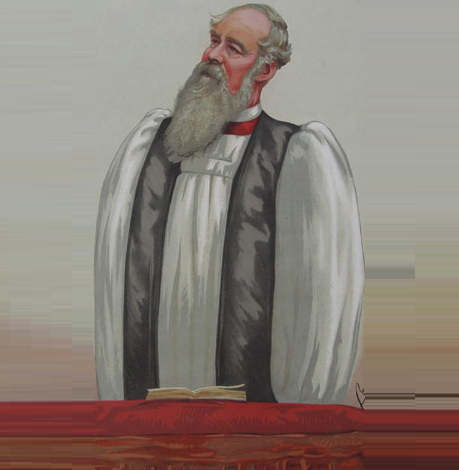 In December 1841 he was ordained by the Church of England and was made Rector of the Church of St. Thomas in Winchester; from there he moved to the parish of Helmingham in Hampshire, serving three years; and then he served thirty-six years in Suffolk. In 1880, after thirty-nine years of faithful ministry, he was made the first Bishop of Liverpool, in the Church of England. He was affectionately known as “the working man’s bishop.” And as a bishop he adopted one single text for his official work: “Thy word is truth” (John 17:7). Ryle was trained at Eton College, then at Oxford. Commenting on his very deliberate writing technique, he said, “In style and composition, I frankly avow that I have studied as far as possible to be plain and pointed and to choose what an old divine calls ‘picked and packed words.’ I have tried to place myself in the position of one who is reading aloud to others.” He credits William Cobbett, the political radical; Thomas Guthrie, the Scot; John Bright, the Quaker orator; John Bunyan, Puritan and author of Pilgrim’s Progress; Matthew Henry, the great biblical commentator; and William Shakespeare, of course, as influences on his pen. 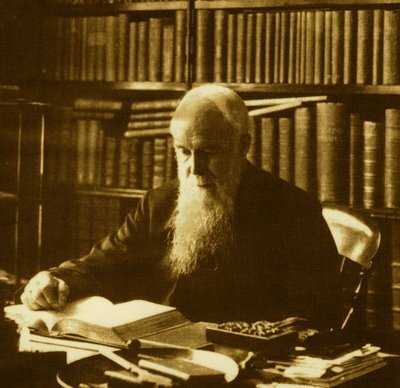 J.C. Ryle was a theological vertebrate. He never suffered from what he called a “boneless, nerveless, jellyfish condition of soul.” His convictions were not negotiable. 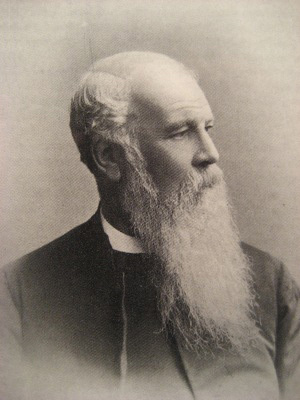 Indeed, his successor described him as “that man of granite.” Archbishop Magee called him “the frank and manly Mr. Ryle.” Charles Spurgeon said he was “an evangelical champion . . . One of the bravest and best of men.” Ryle simply observed, “What is won dearly is priced highly and clung to firmly.” And his fortitude was not limited to doctrinal matters. As a best-selling author he used his royalties to pay his father’s debts. True character is not for sale, neither does it owe any man. This is why his works have lasted—and will last—they bear the stamp of eternity. They contrast fruit which “remains” (John 15:16) against wood, hay, and stubble. Today, more than a hundred years after his passing, these works stand at the crossroads between the historic faith and modern evangelicalism. Like signposts, they direct us to the “old paths.” And, like signposts, they are meant to be read. Ryle had chosen Lowestoft [England] as the scene of his retirement, along with his daughter, Jessie Isabella. He had learned to love the seaside town during his time in Suffolk and so it was appropriate that he should name his new home, ‘Helmingham House.’ The Ryle’s were due to arrive in Lowestoft on March 6th, 1900, but it was the middle of the month before they arrived, further illness having delayed them. The house was pleasant and overlooked the North Sea, but Ryle was in no condition to appreciate the view. He slept badly and had little energy to talk. The end came suddenly. It was June 9th, a Saturday evening, when the doctor was called. He found Ryle partly unconscious. His sons were sent telegrams asking them to come immediately but only Herbert, not far away in Cambridge, came in time. 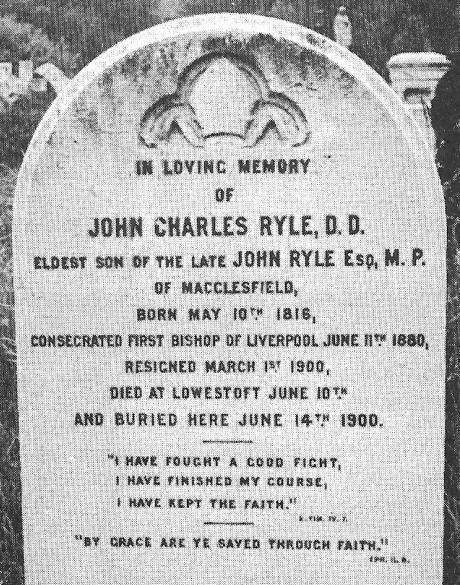 At 2:15 p.m. on the Sunday afternoon, the Lord’s Day, John Charles Ryle went to be with that same Lord. On Wednesday morning a small crowd gathered at Lowestoft station to pay its last respects. The huge oak-paneled coffin was put in a special funeral car attached to the 7:57 a.m. train for Liverpool. Arriving in Liverpool the coffin containing the old Bible from which he had preached was taken to All Saint’s Church, Childwall. As yet there were no crowds; only the Vicar and Bishop Royston were there to receive it. The ivy-clad church stood on the slope of a hill looking out south over the Mersey [river] and into Cheshire. The Bishop had known it well for he had visited the grave of his wife there each week since she had died [in 1889]. The morning of the day of the funeral began grey and drizzly but by the afternoon the weather had brightened up and people in their thousands came out from the center of Liverpool in the special trains. The service was quite simple. Archdeacon Taylor read the first lesson from Psalm 90. ‘Rock of Ages’, Ryle’s favorite hymn, was sung. The second lesson was from I Corinthians 15 read by Archdeacon Madden. It had been planned to end the service by the graveside but the rain came on. Therefore after the service in church only the words of committal, said by Bishop Royston, and the benediction, given by Bishop Chavasse, were said by the graveside. 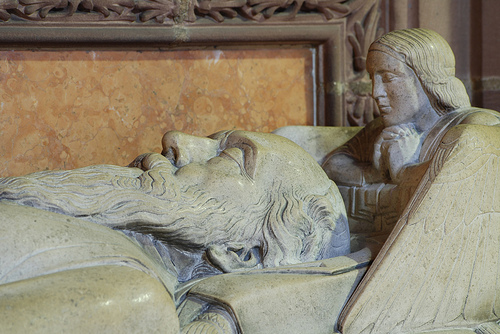 The body of J. C. Ryle, with Bible clasped in his hands, at last lay next to that of his third wife. The gravestone on the left marks the grave of Bishop Ryle. The stone on the right marks the grave of his third wife Henrietta (Clowes) Ryle. His first marriage was to Matilda C. L. Plumptre on Oct. 25, 1845. Matilda died in June 1847. On Feb. 21, 1850, Ryle married his second wife Jessie Elizabeth Walker. Jessie died in May 1860 from Bright’s disease. In Oct. 1861, Ryle was married to Henrietta, who died in 1889. The Ryle gravestones; Ryle on L, wife on R.